Just about everyone has experience with an Interactive Voice Response but might not entirely realize it. IVR is the telephony system that interacts with callers by collecting information and intent and directing callers to the best agent or department. IVR systems can utilize either keypad presses or voice responses from callers to help connect them with their specific needs. IVR systems will collect information such as who the caller is, the issue they are having, the product they have purchased, or the department they wish to speak to. Older IVR systems would rely specifically on key presses, but more modern IVR solutions have added intelligence voice recognition and even artificial intelligence in some circumstances. The overall idea of an IVR system is to make calls as easy, efficient and simple as possible for clients and agents as well. With an IVR system collecting information and directing calls, callers are directed to the department they need specifically in a shorter amount of time, thus improving the customer experience. This also allows agents to handle the same issues from the same department, as opposed to forcing agents to become experts in every single department and subject. This allows agents to provide better support, and callers to receive the help they need with less hassle. Some IVR solutions will even collect verification information or context, providing agents with crucial details to help solve inquires faster. IVR systems essentially act as a virtual receptionist for your business. An IVR system can revolutionize the way your business handles incoming phone calls. Whether your business is receiving sales inquiries or support requests, an IVR system equips your business with the necessary tools to ensure each call his answered and handled with a satisfactory conclusion, within a reasonable amount of time. 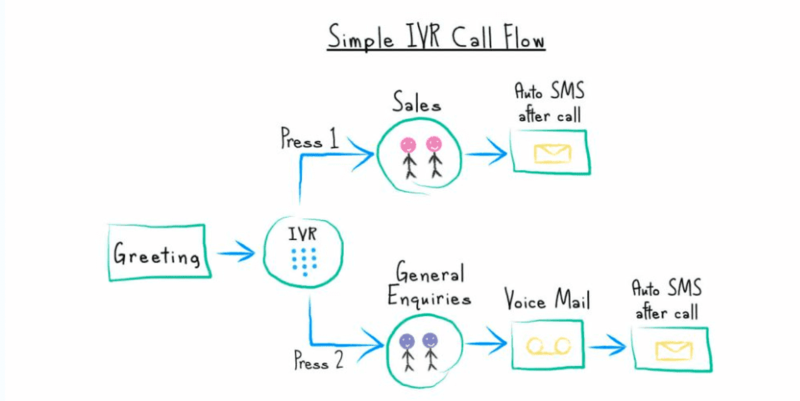 IVR solutions allow your business to collect caller’s individual intents and motivations for calling prior to connecting them to an agent. This allows for a high level of organization within your call center, and works towards increases your organization’s first contact resolution. Callers will be directed to the right agent or department, saving time and improving the efficiency of your contact center. Automation is quickly becoming a major customer experience trend. Providing callers with the tools they need to solve their own issues enables faster resolution time, and generally improves caller satisfaction. IVR systems specifically can offer self help options for simple inquiries, such as shipment tracking or order information. Through the use of an IVR solution, your call center will gain more information on exactly why a caller is contact your business. This enables your call center to better prioritize calls based on urgency or complexity, and direct them to the proper agent or department the first time, improving overall efficiency of your organization. A properly designed IVR system should work with callers, not against them, collecting critical information and context. With an IVR system always directing callers to the department they need, they can receive the help they need with much less hassle and time spent on hold or juggling between different departments. Because an IVR system is directing callers to the appropriate department each and every time, agents are able to focus directly on one specific facet of your business, enabling them to deliver the best service possible. Agents will become familiar with common issues, and will be able to resolve inquiries much quicker. Not all hosted IVR solutions are created equally, and not every single solution will contain the same features. Take a look below at some of the most critical aspects of an IVR system to better understand what your business should keep an eye out for when searching for a provider. Old school interactive voice response systems relied specifically on keypad presses, requesting callers to hit a specific button for the department they need or issue they are trying to resolve. Modern IVR solutions now come with Natural Language capabilities, enabling your system to listen to callers as they speak directly to the system. This helps provide a more natural experience for callers, and even lets your IVR system ask for more complex information that could not be represented by a keypress. Hosted IVR systems may seem like they lend themselves to inbound calling specifically, but that isn’t necessarily the case. Some hosted IVR solutions can work with outbound calls as well, providing personalized messages to callers and providing them the opportunity to interact with the system. Self-service goes hand in hand with automation, and its critical that your IVR system supports self-service options to enable automated customer support. These self-service options will enable customers to interact with your IVR system to solve issues without the need for agent intervention, allowing agents to focus on more complex issues and enabling callers to receive the help they need on their own accord. Call Centers and CRM solutions go hand in hand, and so do IVR systems. When an IVR solution integrates with a CRM application, critical customer information and be automatically injected into the CRM, enabling much greater organization and saving agents time, allowing them to handle calls instead of inputting data. IVR solutions can be rather complex, and it may seem like they could be impossible to setup. Try looking for a provider that offers drag and drop configuration. Instead of learning specific code or if-then statements, your IVR call center can setup a call flow and menu options for the system by simply dragging and dropping and linking together different aspects, visually. Furthermore, you should take into account the size of your business. For example, if you need an IVR system for small business, you will need to consider one that is lower in price but still offers the features that you need. Depending on the specific needs of your business, the features you will be searching for will of course differ. However, there are a few key functionalities that are critical to all IVR systems, and you should not invest in a system that does not offer these features. Automatic Speech Recognition is an impressive technology in its own right, and it stands as a strong compliment to any IVR system. ASR enables your IVR solution to identify words spoken by callers, in real time. The spoken word can even be translated into text for a full transcript of the conversation, to be provided to the agent when they answer a call. ASR enables your IVR to expand beyond simple keypress functions, and allows clients to almost have conversations with the system. IVR systems must be given a script, so they know what to say and how to interact with callers. Some script designers can be clunky, confusing and just down right complex. You will want to find a provider that offers an intuitive script designer, one that is easy to grasp and puts the user experience at the forefront. This is where drag and drop configuration comes in, enabling your business to setup scripts in a matter of minutes. No one wants to have to sit with a phone next to their ear, waiting on hold for what feels like forever. Queue callback is a great feature that providers your callers with the option to have an agent call them back when their place in the queue is finally reached. This is a great quality of life improvement that can help lead to improved caller satisfaction. A critical aspect of IVR systems is how your agents and departments will be grouped together. Call queues help your business stay organized, by grouping callers into different queues for different departments or agents. Ring groups allow you to have multiple phones ring at once when one single number or extension is dialed, which enables your business to distribute incoming calls among different agents. Going even further beyond call queues and ring groups, skills-based routing enables your business to direct callers to the best agent for the inquiry, based specifically on that agent’s skill level. This way, expert agents can handle more complex issues. Callers will simply be directed to the best agent for their issue. IVR systems have quickly become a must have for any small to medium business that is looking to optimize their call center operations. Generally, IVR systems will be offered by call center software providers, but that doesn’t mean all solutions are created equally. Try to search for an IVR system that integrates directly with your existing call center software. This well ensure setup is a breeze, and you do not run into any major issues down the road. If your business is searching for a new call center platform, always ensure that an IVR is included within that solution. While callers may become frustrated with them, IVR systems are still an incredibly critical aspect of maintaining an organized, efficient and productive call center. It is easy to be swayed by the lowest price, or the longest feature list, but its more important to find exactly what your business needs, and a provider that can deliver that. Use our QuoteMatch™ tool to get started with call center software. Do you already use or own Call Center Software? This will help us match you to solutions designed for your company size. What call center features are important to you? We'll narrow down solutions that cater to your needs.